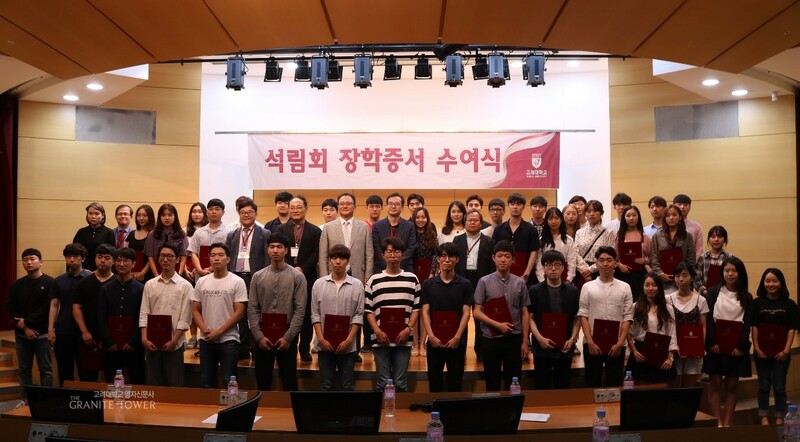 On September 6, Seokrimhoe, a scholarship foundation established in 1970 by the professors of Korea University (KU), held its scholarship awards ceremony for the fall semester of 2018 in the Centennial Memorial Samsung Hall. It selects about 50 students each semester and has now grown into the largest scholarship foundation in KU. This semester, 56 students from 15 colleges including the College of Liberal Arts were selected as the scholarship holders for excelling in their studies and setting themselves up as a standard for others despite the difficult surroundings. “I hope that the intellectuals from KU play a big part in our society in the future,” said President Yeom Jae-ho in the congratulatory speech. Professor Lee Woo-jin (Department of Civil, Environmental and Architectural Engineering), the president of Seokrimhoe, revealed his wishes that the contribution and love from the professors would eventually help the students to build their career. Seokrimhoe expects that the scholarship system will remain as a meaningful custom of KU by the virtuous cycle in which the scholarship holders succeed in the future and grant the fellowship to their juniors.